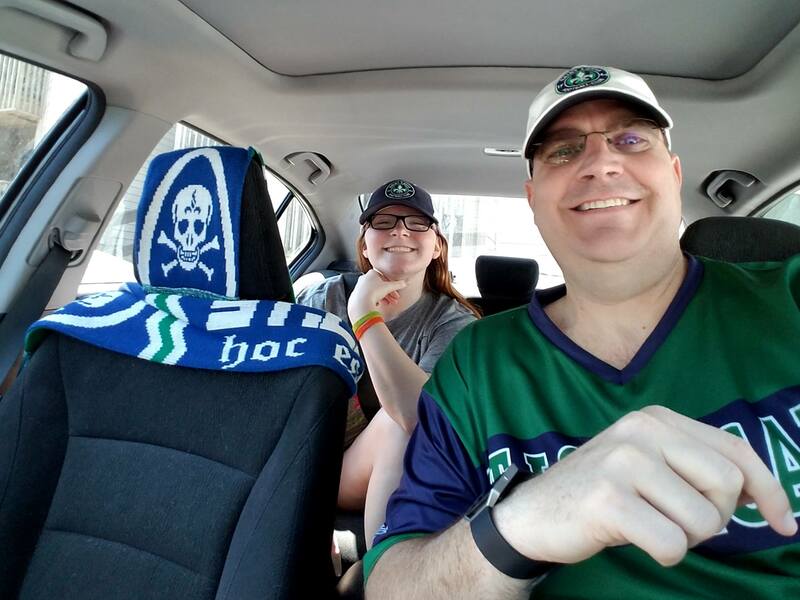 Emily Doke is one of our “underage Louligans” who’s been in the middle of the pack every week. Her crush on Parker Maher not withstanding, it’s great to see the interaction between the fans of all ages and the players. (it’s a loving joke…until the restraining order was lifted when Parker moved on!) We need more Emily’s in the group to carry on when us old folks can’t anymore. Some year or two later my dad asked me if I wanted to go to an outdoor professional soccer game, which happened to be the first one ever for that team. Of course after the experience we had with the Montreal game, I was more than excited to go and check it out. Now I was 12, so bear with me as I try to remember that day. When we arrived at the game, I’m pretty sure we went to the Louligan tailgate. (The St. Louligan’s are the supporter group for Saint Louis FC, and some Louligan’s are American Outlaws as well. Fun Fact: they aren’t your average hooligans…) Hung out there for a while but neglected to march in with them. We went in early and stood by the concessions to watch them march in to Soccer Park. Which I must add was a beautiful sight to see let alone hear. We took our seats in section 4 or something, and watched the Louligans do their thing throughout the game. Watching the game and the players intently, I picked a favorite: the right-winger, Connor Franta (*sigh* a YouTuber) looking defender, #6 Parker Maher. That game changed my life. Whether or not we won or lost, that game was incredible. The atmosphere that the fans created was intense, the game itself was completely different from an MLS game but still led me to want to see more of them. After each game the fans were allowed on the field to get autographs from the players, which actually drew me closer to the team. I got to stand, hug, and have conversations with professional soccer players. A whole new experience for me; being a Blues fan, it isn’t every game you meet the players. I met Parker and talked to him for a little while, while the fireworks went off and I got my picture with him. Which soon seemed to be an every game thing that season. So of course, we went back, this time joining the Louligans with their shenanigans at the tailgate and soon in section 8. After that we went back again, and again.. and again. For the next two years that was a weekly thing during the season, and when there was an away game we watched from YouTube, or of course drove to some of them. Driving to away games is always fun and makes the love I have for the team grow. I go to away games knowing that I am supporting and cheering them on when they need it most. The very first trip we (my dad and I) took was to the Sporting Kansas City Open Cup game on June 16th, 2015. That trip was so fun, we didn’t do anything in KC except for the game. But it was a blast for basically no reason if I’m being honest. Maybe it was the energy the 100’s of Louligans, or you know, the energy of the 21,000 SKC fans. Either way it was amazing and super fun, so I bugged my dad to take us on another dreadful drive to the next away game. Which are our new father-daughter trips since the Peoria Rivermen are no longer available to go see. Continue those traditions of meeting Parker after home games, and the road trips to away games into the 2015 and 2016 season. This is where things really start changing for me and the team. October 2015 is when my parents sat me down and informed me that they were getting a divorce. Most kids are young when it happens and don’t understand it, but being 13 almost 14, you understand what’s happening, and it hurts a little more. However it wasn’t the divorce itself that hurt that bad: it was moving from my childhood home, and all my best friends. But I had STLFC (even though it was off-season), the Louligans and the Blues to help me keep smiling and gave me something to look forward to instead of dreading the moving and the divorce. Once we finally got settled in separate households, it was STLFC season again. Things start to lift up again, and the 2016 season starts and we get to August without any injuries. Then out of no where we lose one of our best defenders to a groin injury. Which, as I’m assuming every Louligan knows by now, happened to be one of my favorites, Parker. That practically felt like a truck running me over but I kept my head high and supported them, even though I knew Parker wouldn’t be playing or attending the games publicly. As many of you know, STL is known for inconsistent teams. When STLFC came along, you added another sport to that list. Even though it is frustrating and we live with it, the team tried a different tactic, and signed a new coach. Goodbye Schilly, hello Preki. However, it was a rude awakening for me because I was not on a lot of social media, or at least enough to know that we got a new coach. When I found out, it was all “ok, yeah new coach, awesome, can’t wait for next season”. But I am so young and uneducated about all this professional business that I didn’t know the coach was going to get a whole new set of guys. This new coach was going to be a good thing for us. A new beginning, you could call it. He re-signed 3 players from the 2016 season: AJ Cochran, Tyler David, and Seth Rudolph. No Parker. As much as I enjoyed meeting him and having him as my favorite player, I had to accept it and let him go onto bigger and better things. Then began the anxious waiting to see where he would be signed next and who would be on our new and improved team. Sure, say that I am a stalker and was waiting to see what their Instagram @’s were, I am used to it by now. The new team arrived and one by one I became attached throughout the pre-season. Haha, that sounds super creepy and stalker-ish but it is the cold hard truth. 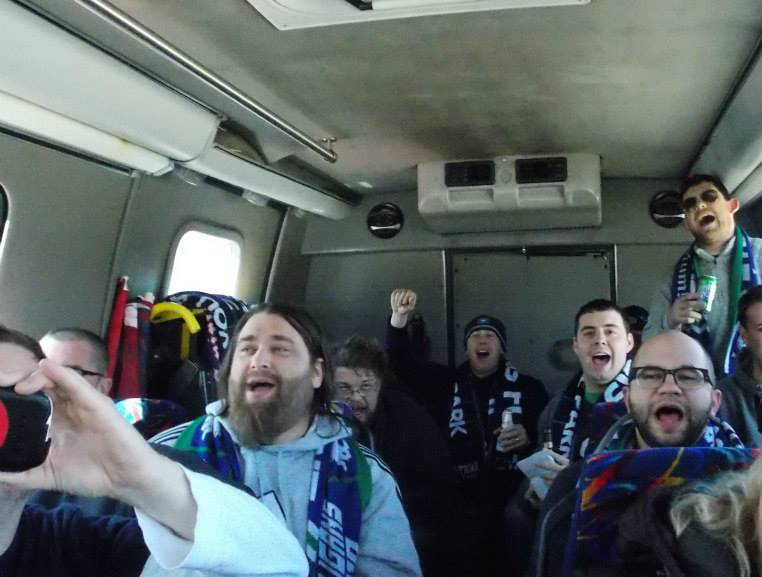 I love being part of the STLFC support group, I love calling this team “my boys”. They got me through my hardest time, and this team was still going to be STLFC, the roster looks different but it is still the same team I watched in May of 2015. The countless Instagram stories, hilarious comments on each others posts, and stupid dares you give each other never fail to make me smile. I just wanted to say thank you to the St. Louligans and STLFC for being my home away from home. Also for the countless smiles you all spread throughout the fan base. 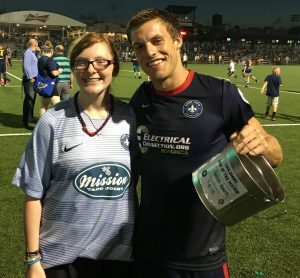 So, what does STLFC mean to me? This team means a lot to me. Too much maybe, so much that all I talk about to my friends is this team, it’s all I look forward to during the Blues off-season. Going to STLFC games is better than going to the high school parties I’m never invited to on Saturday nights. Nonetheless, I love my team and I hope they know that. Never Forget Bus 2, and you are done reading this finally ha.